Everything is at its peak. The melons have never been sweeter. The peaches are supple and slip free of their pit with a twist of the wrist. Cauliflower has never looked whiter, or bigger, for that matter. Broccoli is $.99 a head. A steal. We fill our basket to overflowing. For a few more weeks, we’re celebrate the last of the summer produce. It’s too good to miss. Here’s a selection of my most vibrant recipes for showcasing the last of the late-summer produce. Hopefully this round-up will inspire you to bake eggs in tomatoes for a weekend brunch, or turn cauliflower into a creamy pasta for quick weeknight meal. While you’re at it, grill some zucchini for a salad and churn cantaloup and honey together for a sorbet. It’s almost the weekend, friends! 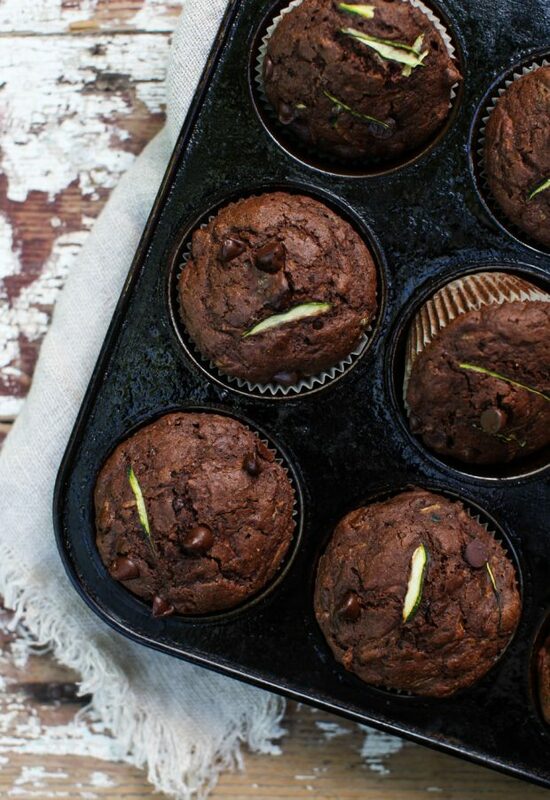 Dark Chocolate Zucchini Muffins ~ If your garden isn’t overflowing with zucchini, then it can be had for pocket change at the markets. These double chocolate muffins are a great way to use up zucchini, and freeze well for quick weekday breakfasts on the bus or after school snacks. Zucchini Apple Mini Muffins ~ A lightly spiced muffin, studded with apple as well as zucchini. Perfect for the pre-school lunchbox. 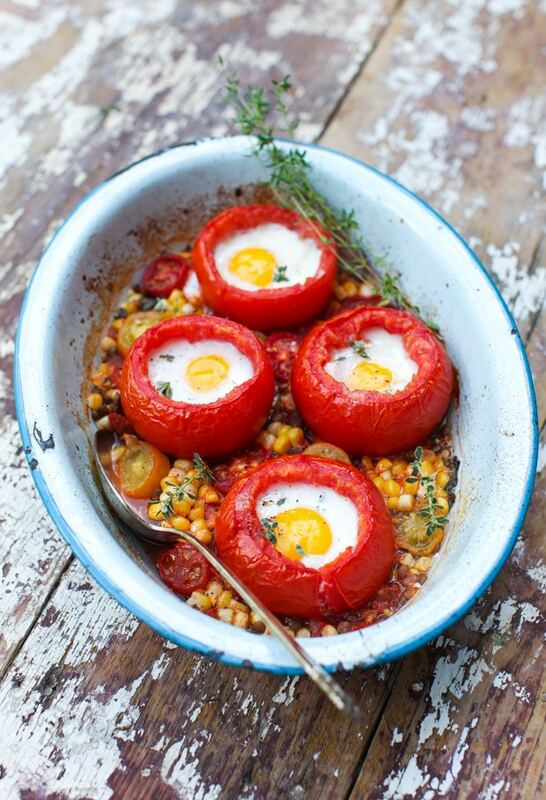 5-Ingredient Baked Eggs in Tomatoes on Roasted Corn and Lentils – And absolute bang-up brunch idea that is lean, nourishing and full of flavour. There’s something about fresh sweet corn in a breakfast dish that is just irresistible, don’t you think? 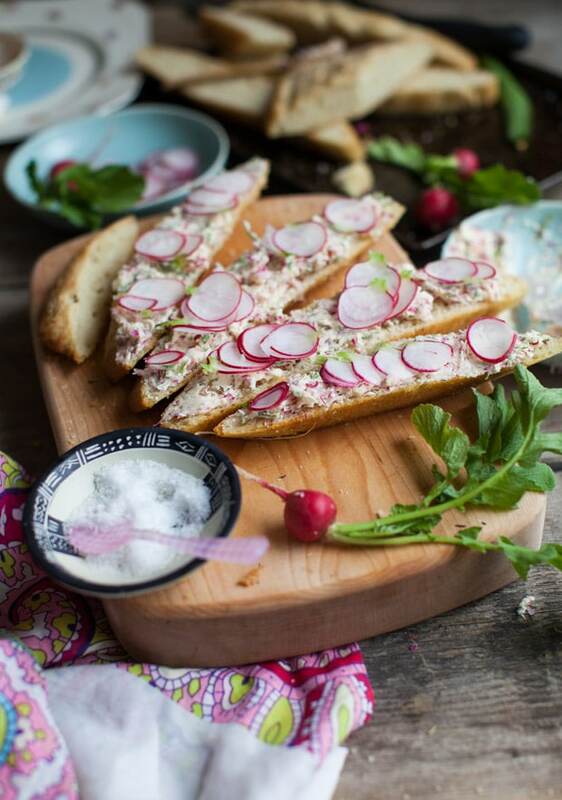 Sea Salt Focaccia with Radish Ramp Butter ~ This appetizer isn’t just for spring! As long as radishes are around you can make a bowl of this spread and serve it with crackers, toast or homemade focaccia. Honey-Drizzled Raspberry Brie Brûlée ~ Another irritable appetizer, this one also doubles as an elegant cheese course for two or four. 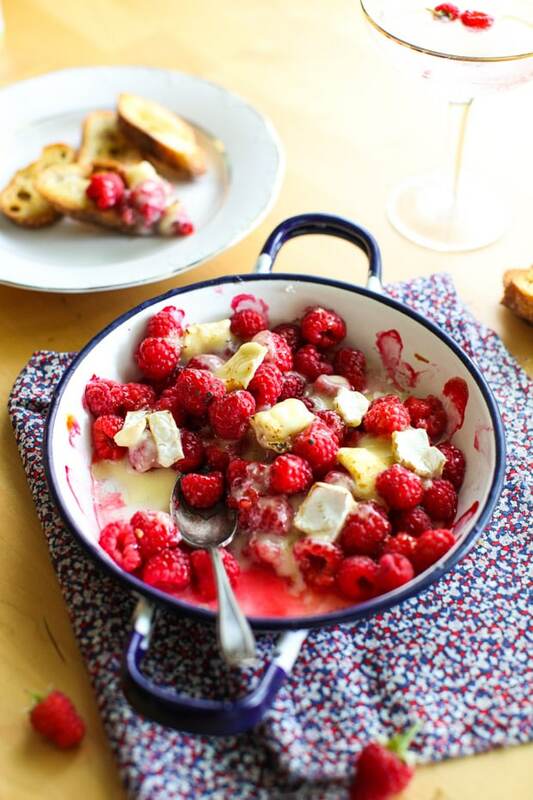 Schedule date night in soon to make this dish before the raspberries are gone for good. 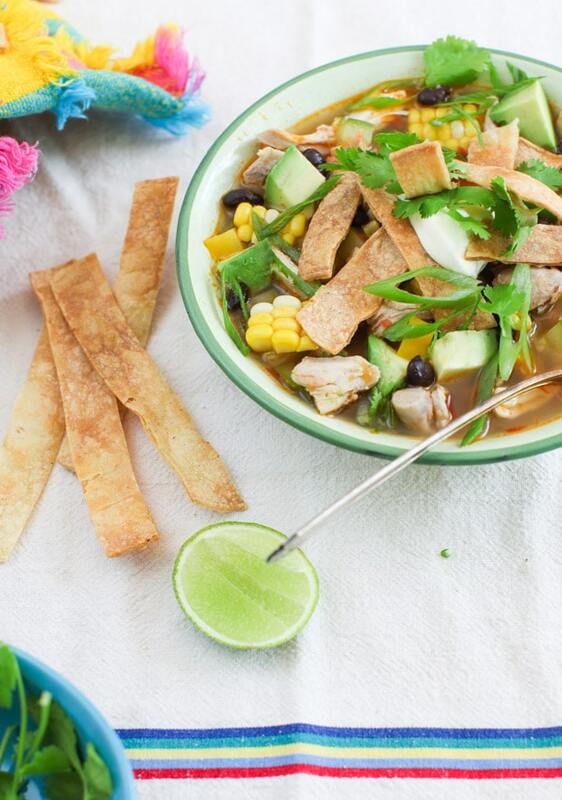 Harvest Tortilla Soup ~ This comforting soup needs to be ladled into bowls and enjoyed around your table this fall. I’ve made it in the winter and it is just not the same without the fresh vegetables. Creamy Broccoli Spinach Soup ~ This one is packed with vegetables and is vegan too. It uses coconut milk instead of cream and is a luscious treat. 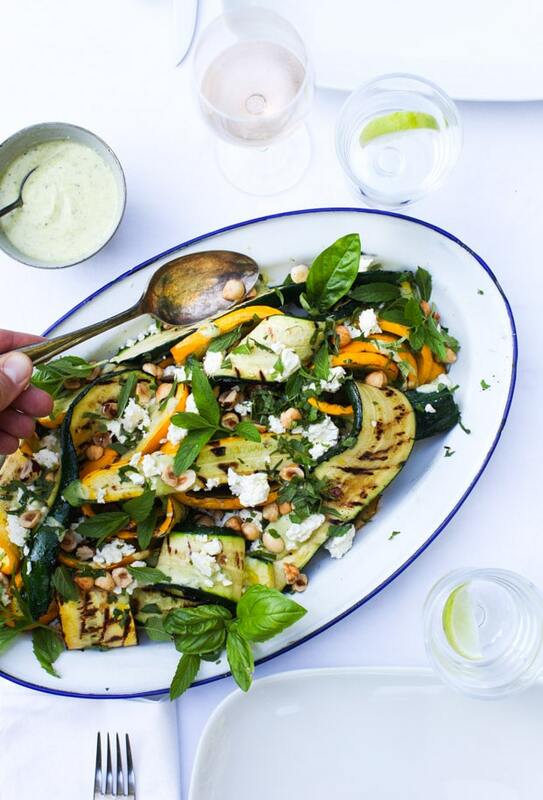 Grilled Zucchini Salad with Hazelnuts, Feta and Yogurt Mint Dressing ~ A favourite from last fall. I can never make enough of this salad! Enjoy it warm or room temperature. Fresh Tomato + Peach Caprese Salad with Wild Blueberries & Thyme ~ A summertime classic, reinvented. 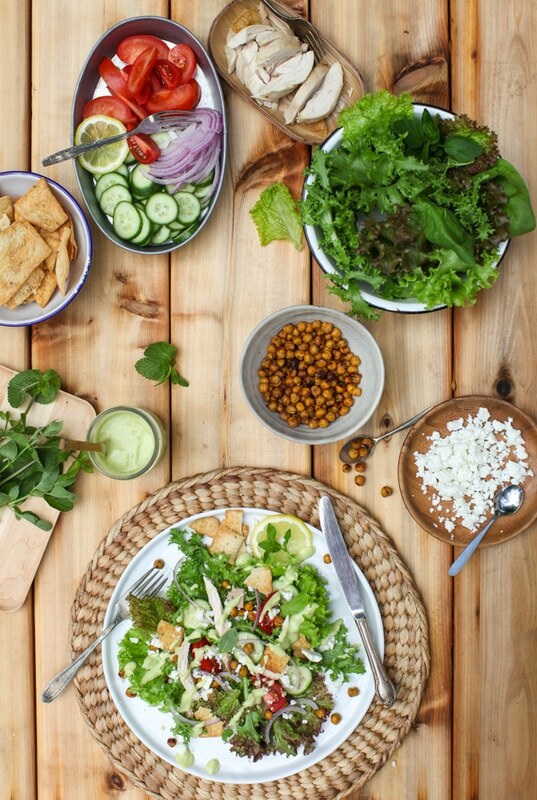 Middle Eastern Taco Salad with Roasted Chickpeas, Tangy Avocado Dressing ~ It’s a bit meal-in-one salad, full of the freshest tomatoes, cucumber and crunchy lettuce. 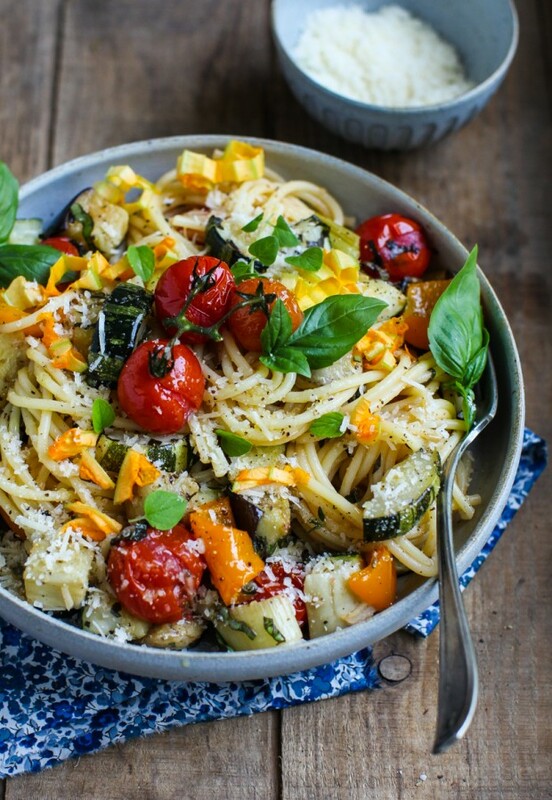 Easy Roasted Vegetable Spaghetti ~ Easy is right! Here’s a pasta that uses up all the leftover vegetables in the crisper drawer and yields one big pot of comfort food. 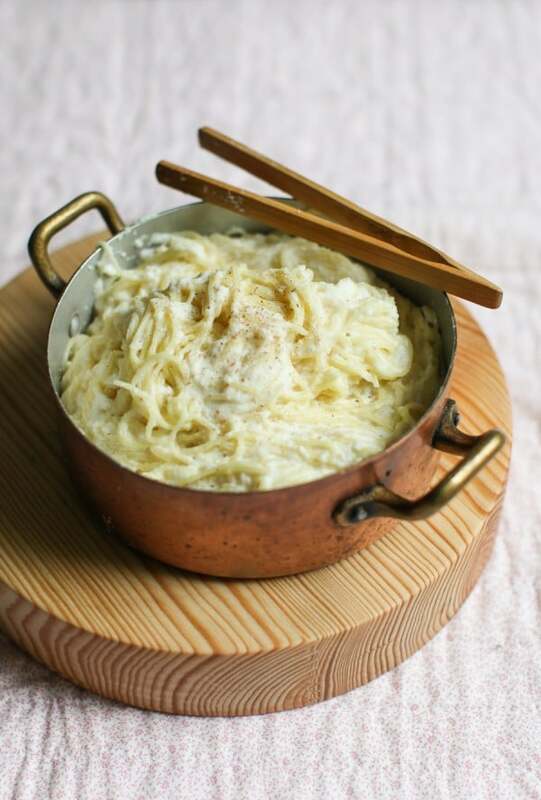 Creamy Cauliflower Capellini ~ Make this dish in under 10 minutes and then watch it disappear just as quickly. 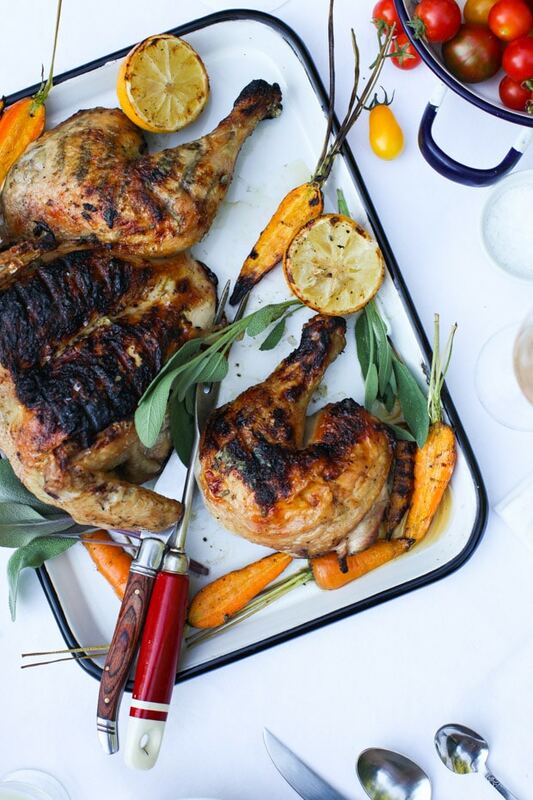 Sage-Scented Barbecued Chicken with Grilled Lemon ~ This one is on tonight’s menu. We love the aromatics of sage and lemon paired with the smoke from the grill. Grilled Chicken and Sweet Pepper Fajitas ~ Here’s a dinner the whole family can help with – grating the cheese and shredding lettuce, while you multi-task on the grill with the vegetables and chicken. 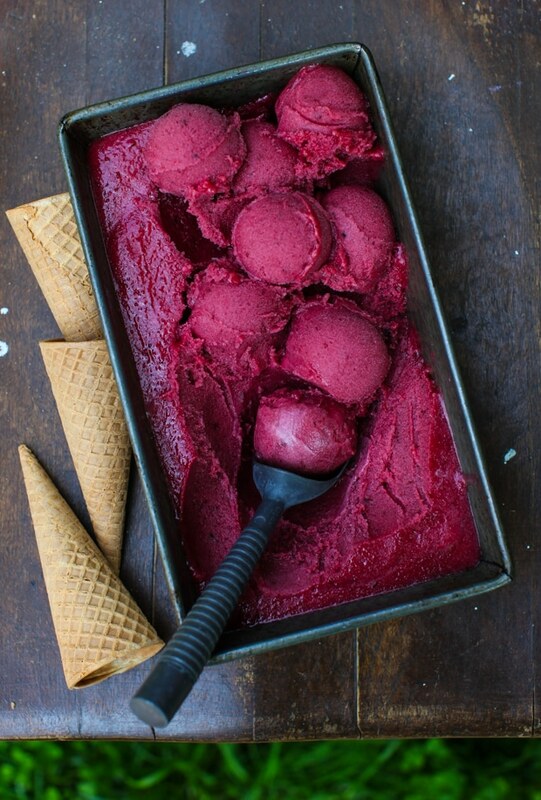 Muscavdo Blueberry Plum Sorbet ~ Vibrant in colour and flavour, this easy sorbet is one of the best summer dessert recipes on this blog. Salted Cantaloup Honey Sorbet ~ Honey simple syrup and a touch of salt brings out the full flavour of the cantaloupe in this delicate sorbet. A sweet finish to the summer. 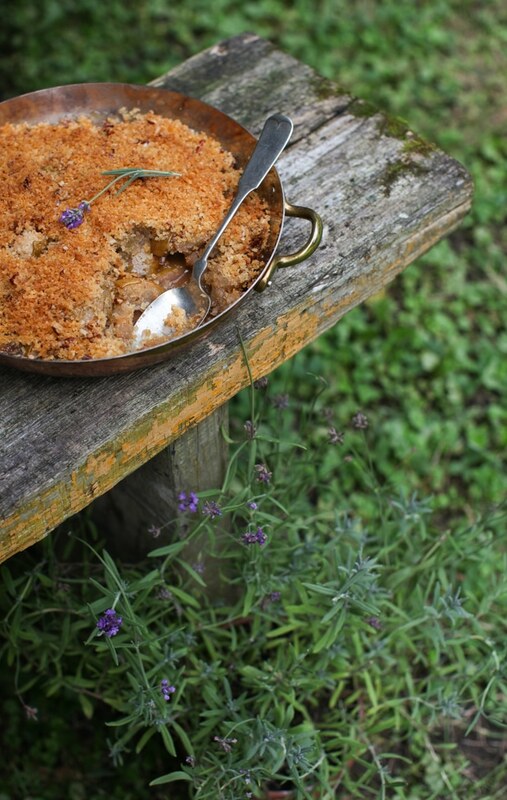 Extra-Crispy Pear-Lavender Crisp ~ Delicately perfumed with lavender, this late-summer dessert is one of the best fruit desserts to ever come out of my kitchen. What are you cooking and baking, canning or making with the last of the summer produce? Ohhh I remember loving that Mediterranean salad of yours! I just bought (probably) the last caselot of local peaches. I have no idea what I’m going to do with them. They are DIVINE right now just on their own. We had Eggs in Tomato Cups the very day you posted this list! We are also eating a ton of zucchini, tomatoes with every meal (sometimes just sliced on a plate), and cucumbers. Things finally seem to be hitting their stride around here in the Pacific Northwest. Can’t wait for apple season! We will be trying the Zucchini-Apple Muffins this week! Thanks for the great recipes! That’s so fun! Our cucumbers haven’t been great this year – watery from all the rain. But we’re excited for apples too! I want to try canadian kraft dinner.